Shop manual blood pressure monitors at ADW Diabetes. Manual blood pressure monitors are good for anyone who wants to measure their blood pressure manually. At home is highly beneficial as you can test whenever you want! At ADW Diabetes you can find the best prices on all the top brands including Omron, Clever Choice, Advocate, and HealthSmart! 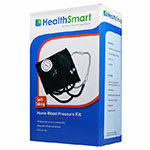 Browse through our wide range of blood pressure monitors and trust us for low prices and service.